DPCI helped Scientific American find a digital asset management system to centralize and manage rights and permissions for a significant portion of all published editorial content, including text, illustrations and photographs. DPCI Assists Scientific American with Digital Asset Management Procurement Process. Since 1845, Scientific American has been the leader in informing the public with the latest scientific insight and technological news. The oldest continuously published magazine in the country, Scientific American provides the latest research, news, and features for its readers. Over the years, authors such as Albert Einstein, Francis Crick, Jonas Salk, and Linus Pauling have all submitted their works and left their respective marks on the publication. The magazine has readers worldwide. In June 2007, Scientific American set out to find a digital asset management system to centralize and manage rights and permissions for a significant portion of all published editorial content, including text, illustrations and photographs. The new system would ultimately help staff reuse legacy and new content across print and digital media more effectively. Realizing the breadth of product options in the Digital Asset Management market, Scientific American retained DPCI, an interactive technology agency that delivers integrated content management solutions, to help the company refine its requirements and manage the request for proposal (RFP) process. DPCI worked with stakeholders from Scientific American's information technology, editorial, production, and digital media departments to define detailed functional and technical requirements for the new digital asset management system. The team paid particular attention to defining Scientific American's needs around rights and permissions for digital assets as well as budgetary and technical platform constraints for the new system. Based on the gathered requirements and constraints, DPCI next prepared a matrix of questions for the vendors whose products the team at Scientific American wanted to evaluate. DPCI worked with each vendor to ensure that the responses were accurate and comprehensive and represented the products in the best light. From these vendor responses, the Scientific American team reduced the list to a few finalists. DPCI next worked with stakeholders at Scientific American and the finalist vendors to ensure that product demonstrations were conducted fairly against a standard demo script derived from the documented requirements. When Scientific American was ready to make its final vendor selection, DPCI assisted in reviewing legal agreements, application module pricing, and reference checks to ascertain any outstanding product or customer support issues that Scientific American would need to be aware of before entering into an agreement. "Our methodology is specifically tailored to digital asset management technology, so we are able to help our customers match their requirements to the many product offerings in the marketplace," said Ivan Mironchuk, Technical Services Manager at DPCI. "This makes the selection process more objective and ensures that the best solution is identified within the parameters of the client's needs and budget." "DPCI quickly helped us distill our organization's specific needs for digital asset management," explained Roger Hirschkind, Director of IT at Scientific American. "DPCI's subject matter expertise with Digital Asset Management helped us not only identify the appropriate vendor, but more importantly, provided us a way of thinking about implementing digital asset management that will help us get the most out of our investment." 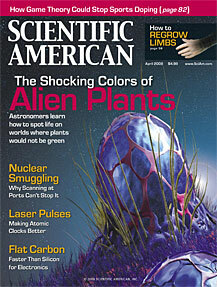 As for the selected digital asset management system, Scientific American chose Canto Cumulus software. Cumulus will be implemented in the First Quarter of 2008 by staff resources at Scientific American in conjunction with OTEC, a Cumulus integrator based out of Toronto. DPCI will be offering subject matter consulting throughout the implementation.